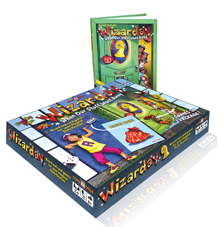 GAME 1: Wizarday - An Exciting Race Around the Day in search for your lost routine item. GAME 2: The 4-Rooms - A fast-paced game of slapping your opinion. GAME 3: Connections - BONUS! A fun card game you can play anywhere. BOOK: Scheduled around Halloween, this hilarious adventure fiction story help the whole family understand what an important role family schedules and time management play in a happy, healthy life. Recommended for 2014 Holiday Gift Guide Angela Addington Dayton Mom-spot Blog. 1. Hard cover story book. 2. Two sided board game.